Reading: It’s summer, so children’s books. The Treasure Seekers by Nesbit, Gone-Away Lake by Enright. Watching: I finally caught up with Killing Eve, thanks to the blizzard on Sunday. It’s just as good as people say! And I have no idea what actresses, if any, could play the lead roles in Hindi and/or Indian cinema. Thinking: I want to spend all my time at my family’s summer house!!!! My parents went up yesterday and I am SO JEALOUS of them. I think I may have to try to squeeze in a trip this weekend. There’s no new movie to watch, why not? Listening: Kalank soundtrack! It really isn’t that good. I’m finding the title song is the only one that makes me perk up and pay attention when it comes on. Now, question for you! Throwback time! Just for kicks, I looked up the movies of 1999 and boy there were a lot of great songs that year! Fight to the death, you can only pick one, which song of the following is your favorite. Or, is it another 1999 song that I don’t include (here is the list of all 1999 movies)? This entry was posted in Uncategorized, Wednesday Watching and tagged 1999, Kalank, Wednesday Watching by mredlich21. Bookmark the permalink. It’s still Spring time in my mind 😉 what makes you think about Summer time and how are kids’ books related to this season for you? Watching… it’s sooooo long ago that I watched series (I hardly watch anything on tv)…if ever I watch something it’s still movies with the kids (on DVD or VCR). Chicago spring is odd, either it is a blizzard, or it is as warm as summer. Yesterday and Saturday were near 60. I always read children’s books in summer because it makes me think of summer vacation when I was little and I spent all my time reading. And I read romance novels at Christmas, and mysteries in the fall. I like Baadshah too! Mostly putting those songs together made me realize how much better soundtracks used to be. More songs, more different songs, all of that. None of the songs from Kalank can come even close to these, and that’s the biggest most song-filled movie this year, excepting Gully Boy. Nothing new there except that he will decide his next movie by June. He will be in China for 3 or 4 days. Tomorrow is the panel discussion and the red carpet is on the 20th. I’ll be curious to see how this is all reported in the Indian press. Hopefully it gets as good a response as the doctorate did. The articles seem to be nice enough but it’s nothing coordinated like with the doctorate. It seems like they’re picking up things from here and there on twitter. But there is still time since he should be there for 3 more days. We should be getting some actual interviews because some pics have come out but I have no idea where or how they would be accessed. Chinese media is almost impossible to penetrate if you don’t speak the language. There’s a panel discussion tomorrow about India/China cooperation. Kabir Khan and Chinese directors are also supposed to be a part of it. I kind of expect it to be pointless though. I saw an Indian article that Katrina is supposed to “perform” at the fest. I genuinely don’t understand what that means. What kind of performance would she give at a film festival? Huh? Maybe she is just going to be on a panel and it was miss-translated? It was an English language article in an Indian paper that mentioned Katrina performing. Who knows what they meant. 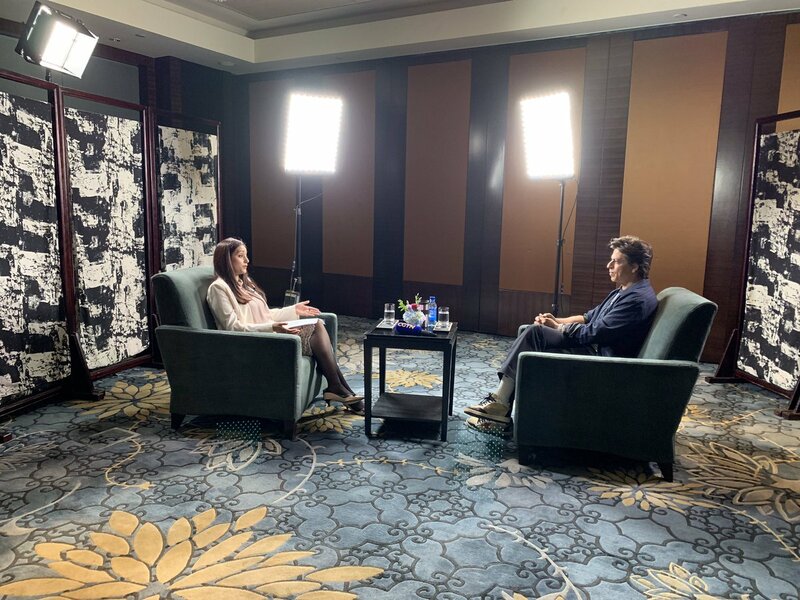 Here’s a short video clip of another SRK interview for Chinese TV. The man was busy! Even though he’s speaking English, I have no idea what they’re talking about. I *think* it might be about Andhadhun doing so well in China. From the translation, it seems like Mom, Ittefaq and 2.0 are releasing next in China. Hmm. This is all making me think about PR strategy again. 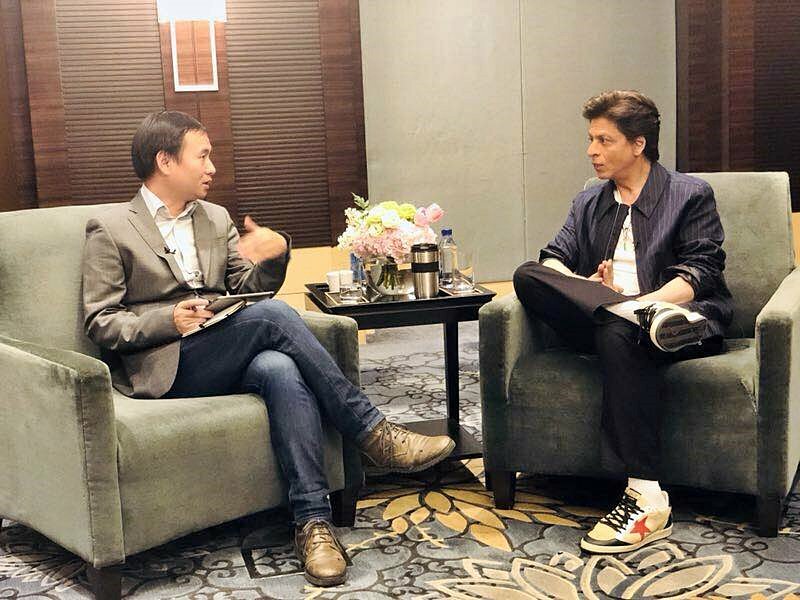 Maybe they are letting this stuff leak out willy-nilly, and then once the 3 days are over, they will make available a nice clean summary that says “SRK’s film Zero was honored in China through this and this and this event, Shahrukh himself was honored by this and this, and now everyone is happily back in India”. Instead of trying to play catch up as things are happening. I watched a very interesting movie about music this week – Katyar Kaljat Ghusali. It’s marathi film, Subodh Bhave (Rani’s fiance in Aiyyaa) directed it, and played one of the main roles, and Shankar Mahadevan is in it also. I absolutely loved it because Hindustani classical music is the protagonist, the reason people live, argue, make peace. And there is one beautiful song after another. Must watch for music lovers. I enjoyed it much more than Sarvam Thaala Mayam. I thought you would like Mubarakan!!!! And no Athiya Shetty problems, right? They use her perfectly. About 15 minutes of screentime and almost no dialogue. Yaaay! Can’t wait to discuss it on Sunday. Absolutely no problem with her. I even liked her character. Thank you for the Katyar Kaljat Ghusali rec, that sounds really good! I hope you will like it. The plot is simple, and sometimes you can see it’s based on a play, but it doesn’t matter because the most important is the music. Taal, and HDDCS have beautiful music, it’s true, but I detest both movies so much that I can’t even listen to the songs. Btw do you have a post about the movies you hate, and regret watching? Reviews for Kalank are coming out and it doesn’t look good. I try to remain away from reviews, but I did see that Karan proudly retweeted one of those posters with the star ratings listed out. And there were a lot of 3 star ratings there. If the films own promotion team can’t dig up enough 4-5 star ratings to make their promotional poster look good, it’s a bad sign. I am reading several weeks of DCIB because I am so very behind. I really enjoyed reading your post on Shaheen Bhatt’s book and your review of Dil Hai Tumara. DHT is such a train wreck, but I still enjoy it so much. I think it is because Preity is just so spunky yet vulnerable. Rekha is stunning and I want want all her saris. And, who cares about Arjun Ramphal’s terrible acting, everyone is just staring at him because he looks so pretty in the movie. I just finished watched Dor after reading Sharmila Tagore’s Justice Sunanda Bhandare Memorial lecture. I cannot believe it took me so long to watch this movie!!! It is so wonderful!!! It made me wish there were more movies recently that show relationships between women and Hindus and Muslims in such a brilliant and compassionate way. I am so glad you read the Shaheen Bhatt post! It didn’t get as many views as I was hoping for, not so much because it was a good post but because it was a good book and I wanted more people to know about it. I can’t completely co-sign on your DHT thoughts, because I just do not like Arjun’s hair in that! 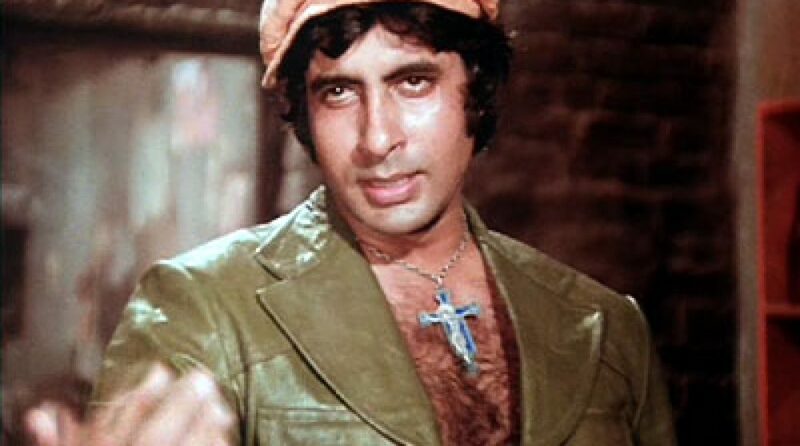 If I want to stare at dreamy young Arjun, I think Tazeeb is my preference. Although DHT is better than Pyaar Ishq Aur Mohabbat which I was never able to get through. I was just thinking about Dor because of Pinjar! They are both movies I haven’t seen but distinctly remember hearing about years earlier from people who told me “you have to watch this movie”. Oh, and it looks like the director of Dor also made Dhanak, which is one of my favorite movies and really beautiful, you should watch it if you liked Dor and haven’t seen it yet. Movies I hated? Not many. I even liked the early ones with Kangana before I started hating HER. Last night, I watched Crazy Rich Asians which was cute and predictable, with a good cast. Then I scrolled for my Indian film fix, and there it was, just added to Amazon, Manikarnika. How bad can it be? I told myself. Just because she’s an unpleasant person, there are others in the cast, it’s a historical, your favorite, and you’re not ready for bed yet. Well, I got less than a quarter way thru before I started drumming my fingers and fast forwarding. A potentially exciting, uplifting story, has been reduced to a series of boring showcases for an egotistic star. I didn’t for a moment believe Kangana’s transformation from spunky hoyden to royal wife to noble leader. And her eye lashes, even in the heat of battle, are thick as a Tootsie Roll. Her King is lumbering and badly wigged, her supporting cast presented as acolytes to her glory, and the Brits as ludicrous string puppets of evil. The movie is baaaad. Many other actresses could have done justice to the lead role. Many other directors could have given the story the respect it is due. SS Rajamouli? The funny thing is Rajamouli’s father wrote the script., he also wrote both Bahubalis and Eega and Bajrangi Bhaijaan. At least some version of the script. And I think he was the one who suggested Krrish as a director. And then Kangana took over and clearly destroyed the script, and Krrish’s vision for it. That ’99 wiki list reminded the poor times of BigB in late 90s – Lal Baadshah, Hindustan ki kasam, Kohram, and ABCFL losses. So bad, that he finally resorted to a South Indian remake with a Telugu director and Telugu heroine that brought him back partially into tracks – Sooryavamsham, arguably the highest played movie on Television (there are lot of Memes on this). Got back the glory in new millennium with Mohabbatein and KBC show on Sony TV channel. And, the underrated Thakshak from AR Rahman, esp. Rang De for Tabu and the singer Asha Bhonsle and Jumblika. I didn’t realize Rang De was 1999! I may have to change my pick to that, it is a really great song. Eega was great fun, Bajrangi Bhaijaan, if I remember, was enjoyable and absorbing, and the Baahualis (and Mirzya) remain my all-time faves. I followed the Kangana/Manikarnika fiasco (mostly here) and marveled that a talented director, the writer, and scores of players and techies just walked away or kept quiet when she started flexing muscle. Is the industry afraid of her? I think it was just that no one expected her to be that unreasonable. Have you ever had to work with someone who was mentally ill in some way? At a certain point they end up holding everyone else hostage, even if they technically have no power, just because they are able to go farther than you. There is a wonderful woman at my church whose meds were off balance for a couple of years, and at church meetings and stuff there was just nothing you could do. She was still able to take care of herself, she certainly wasn’t violent or anything, but she would take over the conversation and go off on these tangents and there was no way to predict it or stop it. And she was a member of the church and we were a caring community and all that so we couldn’t throw her out. And then her meds got back on balance and now she is a complete delight (which is why I feel comfortable telling this story, she herself would be the first person to acknowledge her problems back then). I picture working with Kangana as kind of similar, only in that case you can’t throw her out because the film is half made and you need her to finish it. But it’s the same kind of so over the top and unpredictable behavior that there is no way to handle it in a logical manner, no way to respond. And yes, maybe they are afraid of her! Not because she has so much power, but because she is so extremely unpredictable, and the press will print anything she says. I was scrolling Prime movies now and I almost fallen from my chair because I found an animated series: Baahubali The Lost Legends. For some reason first season is not available (at least not in Italy) but 4th is, and I’m watching it now. Oh right, I knew about that. There was a book series and a comic book and then animated all launched at once. And none of them were necessarily canon, not based on deleted scenes from the movie or anything, and I was in Bahubali overload by then, so I skipped them. The book was sooooooooooo bad also, it kind of turned me off all the other extra stuff. Hopefully the animation isn’t as terrible. Dubbing is terrible, both in english and in telugu. How’s the plot so far? It’s hard to say because the dubbing is soooooooo bad I can’t focus. It’s like some random people just read ( with bad accent) what is written on the paper. Is the flower part of a plot, or does she just think it looks pretty? Your analogy between Kangana and the woman in your church explained a great deal. It reminded me of the time a respected local journalist decided to write a novel and joined my writers group. We were delighted to have her until we found out she was a manic/depressive who went on and off her meds at will. When she was on, she was lovely. When she was off, she sat with her chin on the table bemoaning what a terrible writer she was. Or she read long, confusing chapters of her work-in-progress, angrily resisted our (cautious) critiques and critiqued us minutely, pointlessly, and endlessly. Eventually, she stopped coming to group of her own volition and we all breathed a sigh of relief. Yes, exactly, you probably could have done something to get her out of the group, but there was a decent chance that she would have reacted in a terrifying unpredictable way. Better and safer to just be quiet and wait for the storm to pass on to somewhere else. I suspect that is what it is like being Kangana’s co-worker, you just keep your head down and get through the film and hope it doesn’t get even worse. I had a supervisor like this once. I got myself transferred out from under her after two months, but I considered it a weakness of the (large) company that she was allowed to work there behaving badly and terrorizing co-workers for years with no repercussions. It poisons the atmosphere. She eventually left for a step up to another large company and didn’t last a year because they didn’t tolerate that kind of behavior, regardless of performance. I had a supervisor kind of like this once too. I don’t think she was mentally ill, she was just a twisted up person. She was the founder and head of a legal aid not for profit, so there was no one for her to answer to (except the board who did eventually get involved after I left). I heard a couple other stories from people about similar situations, just crazy unacceptable behavior from the founder/head of not for profits. I think it’s because of what you say, a large company will not tolerate that behavior. And probably if you were running a for-profit, the customers wouldn’t either. But if you can manage to be charming twice a month to donors and board members, you can continue your reign of terror over the staff indefinitely at a not for profit. Dragging it back to Kangana, in some ways being a film star has the same advantages. It sounds like with Manikarnika, she charmed the heck out of the Zee Studios people putting up the money for the film, they were all in on the Kangana game. The producer was working for her, she hand picked him and brought him to the money men. And she fired the director. So the people left on set were held hostage, the studio loved her and wouldn’t object, her producer was afraid of her, and there was nowhere else to go to complain. I’m on vacation in Spain in a house with lots of family and just a trickle of wifi. Not watching anything here but I did finally get to see Manmarziyan on the flight over. As I commented over on that post, not a perfect script, but fun to watch and I really enjoyed the performances – leads and supporting family characters. Taking the opportunity of the trip to dig into Homegoing by Yaa Gyaasi. I’d been wanting to read it but needed a space of peacefulness to be able to handle the emotions and story. It’s really good, as expected. Original voice and beautiful writing. My parents started opening up our family vacation home last week, and one of my favorite things about it is that we never wired it for internet, or cable. You have to walk over to the little public library to check email. With smart phones and hotspots, it’s not the same total isolation that it used to be, but I still enjoy having that bit of peace and distance from the world. Still haven’t seen Kalank, but thinking about it if I can fit it in a very busy spring schedule with my movie buddy. Saw three non-Indian films over the last week (kind of a staycation/vacation with the parents). Bohemian Rhapsody (mixed feelings because of the politics of the film and kept wondering how Jim Sarbh would have done it differently, but I liked it ok), The Highwaymen (standard, boring Western-style film for middle aged men), and Thor: Ragnorak (really fun, lived up to the hype and got me more interested in catching up with the MCU asap). So excited about the last episodes of Game of Thrones. The first two were great! Also saw Anastasia the Musical here in Philly. Pretty charming and a lot darker than the animated film at times. One of the better film to stage adaptations I’ve seen. Kalank is so-so, but it’s also whole-hearted on the romance, so might be worth watching for you in particular. I have movies for middle-aged men! They are second to “movies for young men who think they deserve a cooler life than they have” in my hate list. I am considering, once Game of Thrones is totally totally over, actually watching it start to finish. This was my Harry Potter system, I waited until one week before Deathly Hallows came out and then read them all. Is Anastasia the Musical based more on the animated one or the Ingrid Bergman one? It’s actually based on both films, but the villain character (the son of one of the soldiers that killed the family) is new to the musical. He’s an affective Javer type villain.